The miniSIPServer open API enables developers to build their own interfaces to configure or manage miniSIPServer. All API are web interface and read only GET requests. Because MSS uses web services to provide API interfaces, we need start MSS web system firstly. Please read the document to get more details about MSS web system. We focus on expanding and improving the MSS API and would really appreciate any feedback you have. Please feel free to contact us if you have questions or suggestions. The API set is based on miniSIPServer V35. JSON is default format for all API query string and their response results. "object" is the target configuration item. For example, it can be 'localuser' if you want to add or delete a local user. All APIs MUST have an API key which is miniSIPServer administrator password. You can use this API key as the 'syskey' parameter. The following parameter is used in all API requests. syskey required Administrator password of MSS. MSS web services will check this parameter for all requests. 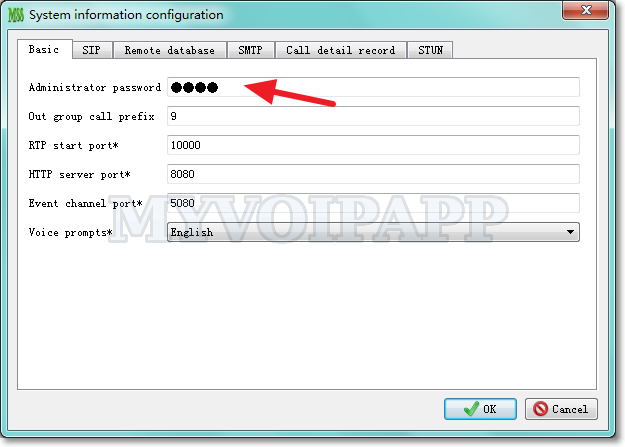 In miniSIPServer main window, please click menu "Data - System" and configure "Administrator password" described in below figure. Once you configure or change administrator parameter, you MUST restart miniSIPServer to enable it. It is used to request miniSIPServer version. This method doesn't require additional parameter except common API parameter. These interfaces are used to query or update system informations. query - query system information. update - update system information. publicaddr string SIP server public address, it could be a domain name. It is better to query system information firstly, then modify the items you want and update them back to MSS through this interface. These interfaces are used to query or update local user's configuration. list - list summary of local users. query - query details of one local user. delete - delete a local user. set - add or update local user's configuration. pageIndex integer By default, MSS will return at most 20 records. If there are more records, we can indicate this parameter to return related result. The default value is zero, that means return the first 20 records. Other parameters are optional and defined as same as the return results in chapter "query". These interfaces are used to query or update external line's configuration. list - list summary of external lines. query - query details of one external line. delete - delete an external line. set - add or update external line's configuration. localUser string Destination number for incoming calls. transport integer Transport type, such as UDP, TCP. state integer State of this line. extLine string Name of the external line to be queried. state integer State of the line. 0 - the line is not registered. type integer External line type. maxDur integer Maximum call duration. By default, "0" means no limitation. chain string Chained line. If current line is failed to make outgoing calls, try its chained line. transport integer Transport. 0 - UDP, 1 - TCP. ogGroupID integer Outgoing group ID. maxMOCalls integer Maximum concurrent outgoing calls. Default value is 20.
otcID integer Time condition ID of outgoing calls. noAnsTimer integer No answer timer. description string Description of this record. maxCalls integer Maximum concurrent calls. aaInd integer Automatic attendant indicator. outbandInd integer Send calls through outband proxy. outbandServer string Outband server or proxy address. outbandPort integer Outband server or proxy port. shareInd integer Indicator that this line can be shared by other local users. origCallerNbr integer Indicator that user original caller number. authidWithAddrInd integer Indicator that the authorization ID should include address information. reInviteInd integer Indicator that the line cannot support reINVITE operation. donotRegInd integer Indicator that unnecessary to register. incomingLI integer Indicator that record incoming calls. extLine string External line to be configured. These interfaces are used to query or update SIP trunk's configuration. list - list summary of SIP trunks. query - query details of one SIP trunk. delete - delete a SIP trunk. set - add or update SIP trunk's configuration. transport integer IP transport, it is UDP or TCP. servID integer SIP trunk ID of the SIP trunk to be queried. callerID string Caller ID in outgoing calls. dialPlan string Dial plan for incoming calls. transport integer IP transport. 0 - UDP, 1 - TCP. otcID integer Time condition ID for outgoing calls. oMaxCalls integer Maximum concurrent outgoing calls. iMaxCalls integer Maximum concurrent incoming calls. orelayMediaInd integer Indicator that relaying media stream for outgoing calls. chainTrunkID integer Next trunk ID if currnet trunk is failed to make outgoing calls. servID integer ID of the SIP trunk to be deleted. servID integer ID of the SIP trunk to be configured. These interfaces are used to query or update group configuration in routing group. list - list summary of groups. query - query details of one routing group. delete - delete a group. set - add or update group's configuration. All values are as same as the result of list result. Other parameters are optional and defined as same as the return results in chapter "List". These interfaces are used to query or update routing configuration in routing group. list - list summary of routing. delete - delete a routing. add - add a routing configuration. routeType integer Routing type. 1 - external line, 2 - SIP trunk. sipTrunkID integer SIP trunk ID if routeType is "SIP trunk"
extLine string External line if routeType is "external line"
All parameters defined in the return values of chapter "List" are required. These interfaces are used to query or update "Transition" records. list - list summary of "transition" records. query - query details of one "transition" record. delete - delete a "transition" record. set - add or update "transition" record. pageIndex integer By default, MSS will return at most 20 records. If there are more records, we can indicate this parameter to return related result. The default value is zero, that means return first 20 records. type integer Transition type, 1 - Add, 2 - Replace, 3 - Delete. All return values are as same as the result in chapter "List". All parameters defined in the return values of "List" are required. These interfaces are used to query or update "Refine caller number" records. list - list summary of "Refine caller number" records. query - query details of one "Refine caller number" record. delete - delete a "Refine caller number" record. set - add or update "Refine caller number" record. These interfaces are used to query or update "Refine called number" records. list - list summary of "Refine called number" records. query - query details of one "Refine called number" record. delete - delete a "Refine called number" record. set - add or update "Refine called number" record. These interfaces are used to query or update "Analyze caller number" records. list - list summary of "Analyze caller number" records. query - query details of one "Analyze caller number" record. delete - delete a "Analyze caller number" record. set - add or update "Analyze caller number" record. These interfaces are used to query or update "Analyze called number" records. list - list summary of "Analyze called number" records. query - query details of one "Analyze called number" record. delete - delete a "Analyze called number" record. set - add or update "Analyze called number" record. servID integer SIP trunk ID. If route type is "SIP trunk", this item MUST be configured. rtGroupID integer Routing group ID. If route type is "Routing group", this item MUST be configured. tranID integer Transition ID for changing called number. reAnaInd integer Analyze called number again if it is changed. Other parameters defined in the return values of "List" are optional. These interfaces are used to query or update "speed dial" service records. list - list summary of "speed dial" records. query - query details of one "speed dial" record. delete - delete a "speed dial" record. set - add or update "speed dial" record. These interfaces are used to query or update group records in hunting-group service. list - list summary of group records. query - query details of one group record. delete - delete a group record. set - add or update group record. strategy integer hunt-group strategy: 1-round robin; 2-linear. queueInd integer Put the call into queue if all operators are busy. maxCall integer Maximum call counts in queue. Other parameters are optional and defined as same as the return result in chapter "Query". These interfaces are used to query or update operators records in hunting-group service. This interface might require a parameter. All parameters are mandatory and defined as same as the return result in chapter "List". These interfaces are used to query or update detection records in hunting-group service. list - list summary of detection records. query - query details of one detection record. delete - delete a detection record. set - add or update detection record. Session APIs are used to modify or update even delete a SIP session in miniSIPServer. number string local user number or outside number. MSS will drop a call according to this number.